Could the Church Today Survive Nero? The times in which we live are full of uncertainties. In America the church is quickly becoming the laughing stock of the nation. It’s no secret that in today's Christian America our influence is severely waning. Our focus has become discombobulated as we look to ourselves first instead of Christ and His concerns. The Presidential election of 2008 saw millions of so-called Christians voting for a man that is for the butchering of unborn children. Why? The ones I know say they are pro-life, yet when confronted they said money is a greater issue. What? Money is greater than life? Wow! But they are not alone. Instead of listening to Jesus’ message of life and the value of life, choices are made quite often supporting the values of the enemy of life, Satan, even if inadvertently through silence. Truly in this, “we hate the full message of the gospel” world but we love the “everything will be ok gospel,” it is easier, more comfortable and least invasive to side with the haters of Christ than it is to stand with the true believers and lovers of God. I am amazed at the amount of things that the majority of church-goers despise about the statements of Christ. For instance, Jesus said, “Most assuredly, I say to you, unless a grain of wheat falls into the ground and dies, it remains alone; but if it dies, it produces much grain. He who loves his life will lose it, and he who hates his life in this world will keep it for eternal life. If anyone serves Me, let him follow Me; and where I am, there My servant will be also. If anyone serves Me, him My Father will honor,” John 12:24-26 (NKJV). That is only one of many passages that teach us to lay our lives including finances wholeheartedly at the feet of Christ. But what the world and the majority in the leadership of the self-centered church despise is sacrifice. The thought of being uncomfortable for Jesus is abhorred. But the sacrifice Jesus asks of us is a Holy Spirit empowered one. He teaches us that in our own power we will never be able to let go or escape from the old life in this world. It is physically and mentally impossible. So it is easier to reject or gloss over His words and teach others to do the same. What they do not realize, or have never been taught, is that loving Jesus and hating the values of the world can only happen through a true relationship to Christ. If they would truly submit it would prove they are His. In the passage above could Jesus be any clearer? Jesus taught that true Christians are like the grain of wheat falling into the ground and dying. Once it is buried and dies, it comes to life in Him. They then listen to a new voice—the voice of truth. 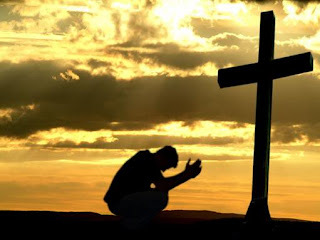 True believers have come to the foot of the cross, not relishing the ways of this world, and humbly laid their lives at the feet of Jesus in prayer. After crying out in repentance for mercy, Jesus literally touched their lives. To the new believer the world no longer holds sway with its glitz, glamor, glitter and treasure —no longer does it hold that appealing lure, for their old life has now been hidden in Christ and the new life He imparts has become their hope.Like Jeremiah they have been induced and persuaded, Jer. 20:7. The self-centered church would have failed in the face of Nero. They do not have their senses dicerned to know good and evil. But I am fully convinced--even today, that the the true spiritually filled church would stand. In our study the author of the Hebrews Epistle was so adamant that those facing trial, persecution and even loss continue on with Christ that he goes to great lengths to prove that departing from a life aligned both privately and publicly with Christ would profit them nothing. Did he tell them they would be lost and separated from Christ eternally? No, absolutely not. He only teaches them that life without obedience to Christ is not life at all. Where would they go? The still standing temple and its sacrifices were useless. Christ alone was the answer. If they would listen to the full message he penned for them they would fully realize just that. His superiority over, the Law, Moses, the Priests, the Sacrifices the Priesthood and more would be confirmed and would help firm up the decision they had earlier made for Christ. History tells us that a multitude of true believers did just that and they chose to stand with Christ rather than love their life on this earth. They heard the voice of Jesus and they said “Yes” I will follow Him to death. And they did. The Hell-Storm we face today is one of impunity. “Jesus is not hip.” “It is ok to not believe.” He means nothing to the majority, even though in heaven He weeps for our souls.Yet the mission has never changed. he still calls out His army to serve and to go into the trenches and to fight His good fight. Soon the door of heaven will be opened and the Lord will shout from the heavens calling His church home. Oh what a glorious day it will be. When the salt of the earth is removed life on earth will become unbearable. For then there will be tribulation on this earth such as the world has never seen. Jesus warned us of these things, “For then there will be great tribulation, such as has not been since the beginning of the world until this time, no, nor ever shall be. And unless those days were shortened, no flesh would be saved; but for the elect's sake those days will be shortened,“ Matthew 24:21-22 (NKJV). Please hear me out. I believe the words of Christ. I believe he died for my sins on the cross and was buried. I believe He arose from the grave and defeated the enemy of mankind, death. Because of this, I choose to believe the words of Christ. I choose to suffer with Him if need be. I choose to die with Him and for Him if need be. There is nothing on this earth I treasure more than Jesus. It is my hope that when the “Hell” storm of life comes your way you will have already made the decision to serve Christ. No man, no preacher who lives like the world, no preacher who tells you it is ok to vote for your own passions and shy away from being zealous for Christ is living as the Scripture indicates. Preacher/Teacher if you have read the Scripture you know I am right or else you are not truly saved. This message may sound harsh to some, but sometimes the truth has to be told point blank. It is time to quit playing games with Christ. It is time to get serious! Who are you going to serve? My motivation for writing this series is purely one of love from a broken heart. It hurts me when I see the church of Jesus Christ and Jesus Himself being disdained and trampled. I know that heaven is near. He will not endure this much longer before He is forced to hallow His name. Consider this a warning, the time to repent and turn to Christ is now. Recognize your sin and tell Him you need His awesome Grace and merciful forgiveness. He promises that He will cleanse your heart and forget all of your past life. Please do not pass up His offer.